Texasdaisey Creations: I Like These! This is one of the magazines that I like to read. It is a bit pricey for a magazine but it is a good value because it gives in depth articles about the latest products and procedures that are available in the beauty world. They have a large panel of experts that contribute and I have found it to be a valuable tool in helping me to decide just how far is okay for me personally in the pursuit of beauty. I have found the articles very informative & helpful in answering many of my questions. 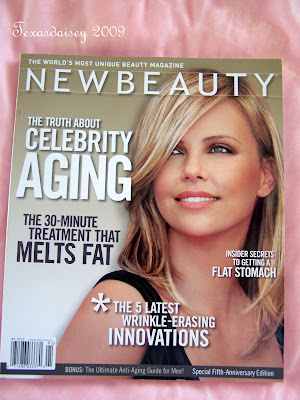 Newbeauty is also the sponsor of the Product Sample Testube that I posted about in an earlier post. Here is another one of my favorite magazines. Lucky Magazine is full of ideas for how to mix the latest styles to suit each individual as well as many articles about the latest in fashion and where to get it. I love that they are not fashion snobs. They give many alternatives to the pricey high fashion looks and they include the higher end products as well. One of my favorite features are the sticky notes that are included in every issue so that you can tag your favorite things and find them easier when needed. This is a very affordable magazine and Lucky is sponsoring a month's worth of giveaways in March with a 1000+ chances to win. Pick up your copy today! Note: this was not a paid post and there was no exchange of goods or services for any of the recommendations or mentions in this post. will visit you soon! smiles.. I really need to start looking at some of these more often. The only time I look into something like this is when I'm getting my haircut...sitting in the chair.